2.1 Can You Try Out Some Chairs? 2.2 Do You Need Arms or a Back on the Chair? 2.3 How much moving around will you be doing? 2.4 To Swivel or Not to Swivel? 2.5 How Much Can You Spend? The thrill of the hunt. Bagging that elusive prey. Showing that you are at the top of the food chain. Is there anything more exciting than knowing that you’ve made that one in a million shot? Nothing really comes close, does it? Of course, not all the time we spend hunting can be as exciting. In fact, sometimes you need to sit and wait. Patience is a virtue in this game for sure. It’s much easier to be patient, though, when you’re comfortable. Also, getting comfortable can be hard if you’re camped out in the middle of the woods or stuck in a blind the whole day. 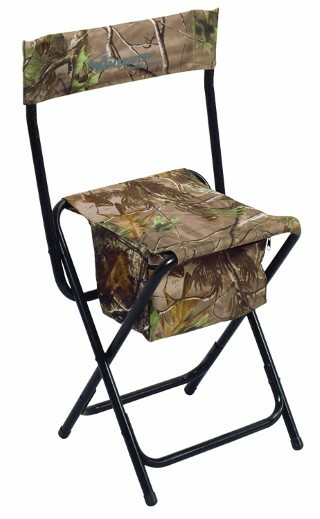 Fortunately, having the best hunting chair will go a long way toward helping you get comfortable. There are so many options out there, so how do you choose? Every company claims that its model is the best hunting chair, but that’s not always true, is it? That’s why we decided to create this review. We want you to be able to find the best hunting chair for your needs. Are you ready to see what model we thought earns the title of best hunting chair? In terms of price, this is in the higher price range. So, if you’re on a budget, it’s probably not going to suit you. Is it worth it? If you need to spend five or six hours in a blind, then yes. This chair is so comfortable that we’d consider watching the game on it at home. The company has used an ultra-lightweight alloy to ensure that the chair is sturdy and stable without being too heavy to be of use. It’s well-built and will last you for many years. The stitching is securely done, and it won’t tear easily. The fabric is hard-wearing and very durable. It is easy to clean. You just need to wipe it down with a damp cloth. The fabric is mold-resistant, but we’d advise that you make sure it’s dry before you pack it away. It has a swivel function as well, but in this case, the action is noiseless. You can swivel quickly and easily, and no one will realize that you’ve done so except for you. Just don’t get carried away while spinning or you may get dizzy. It’s not a perfect model, however. We did think that it should have a stand for your bow or gun. You can get these, but they’ll cost you extra. On the downside, you’ll pay more for this chair. On the upside, it’s likely to be the last chair that you’ll ever need. 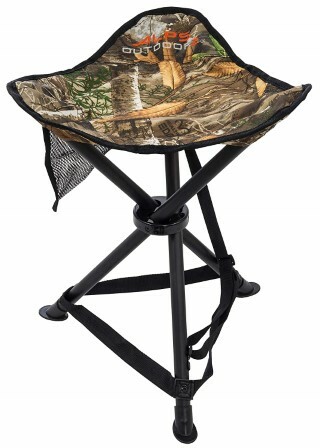 This gets our vote as one of the best hunting chairs in spite of the price. Trust us; the comfort is worth the extra. This model gets our vote as the best hunting chair in terms of value for money. It certainly is very comfortable thanks to the seat height being adjustable. 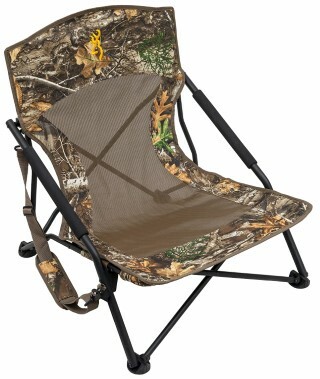 It is also a full back chair that gives you some extra comfort while hiding out in a blind. Where do we start? Each leg can be adjusted individually, meaning that no matter how uneven the ground is, you can still feel comfortable. If you’re in an area with uneven terrain, this is a feature that you’ll really appreciate. The legs have swivel feet attached. This, in addition to the swivel mechanism under the chair, make this one of the most responsive chairs out there. If you want to be able to adjust positions fast, this chair makes it possible. It will swivel around 360 degrees. We did find that swiveling produces some noise, so do keep that in mind when you’re hunting. The chair comes with a strap to make carrying it much easier. The chair is on the heavier side, so that’s a bit of a downer. That said, you will love the extra comfort. Personally, we’re quite happy to deal with the extra weight if it means being able to sit so comfortably for hours at a time. If you don’t mind using some muscle here and there, then this may be the best hunting chair for you. The main selling point for this chair is its low-profile. It offers you a comfy place to sit down, without adding an inordinate amount of weight to your pack. After all, if you’ve got to lug it around the woods all day, it better be light-weight. It’s collapsible, so it’s a simple matter of stowing it when you don’t need it anymore. We liked the durability of this model. The frame is made of steel that has been powder-coated. The joins are nice and strong. They will stand the test of time. The fabric used for the seat is hardwearing but also comfortable to sit on. 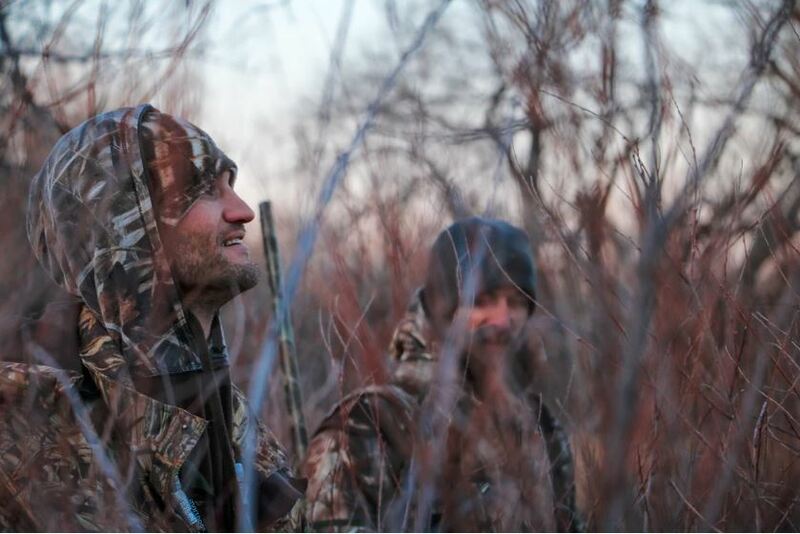 You can choose between two different camouflage patterns or Realtree Xtra. The chair is unobtrusive in a natural environment. The fabric blends into the scenery quite well, so you can keep yourself unnoticeable. There are two different sizes to choose from. So, if you’re a big guy, you’ll want to consider getting the slightly bigger one. The stitching has been done well and will hold well. This is not one of those chairs that will break after you’ve used them a couple of times. Is this the best hunting chair for you? It might be, depending on how low profile you like to be. If you’re rather tall or have long legs, this might not be the best hunting chair because it does sit pretty close to the ground. This is a good option when you’re out and about and need to be able to set up in just about any terrain. This is a pretty simple stool. It has three legs and a webbing strap underneath to help stay stable. Sitting down on it, you feel as though you are nicely supported. This chair will not collapse out underneath you. The legs are made of steel that has been powder coated. The fabric used for the seat itself is 600D polyester. This fabric was chosen because it is durable, hard-wearing, and easy to keep clean. Nine times out of ten, a quick wipe-down with a damp cloth will be all that’s needed. For stains that are harder to shift, you can soak the seat in warm, soapy water and scrub it clean. The fabric is quite dark, so stains are not that easy to pick up. 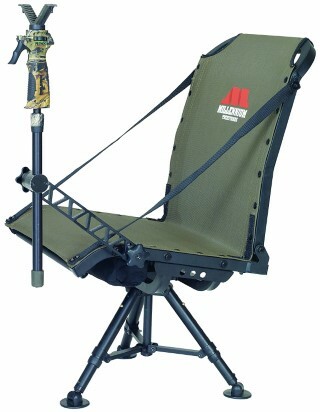 This might be the best hunting chair for you if you like something easy to carry that doesn’t take up much space. It weighs less than two pounds and collapses down quite small. The carrying strap makes it easy to transport. Would we settle down into it to watch football on a Sunday? No. It’s comfy but not in that way. Is it ideal for hunting? Most definitely. We’d say that this would best suit hunters who like to move around. The lightweight nature of the stool makes it ideal for that. If you regularly spend hours in a hide, you might want to reconsider this model, though. We do have to say that when you’re lying in wait in a hide for a few hours at a time, you want to be comfortable. That’s where high back chairs definitely have an advantage because they allow you to relax completely. The company has made the seat a little narrower, perhaps to compensate for the extra weight of the back. So, if you have a larger rear, this might not be the best option for you. If you look at convenience and weight, this chair scores top marks. It collapses down nicely and is easy to store and carry. It doesn’t add much weight to your pack, which is a huge plus. You’ll be pleasantly surprised at how stable this chair is. This is ideal if you’re hunting in hills or a rocky area. This is another chair that’s not going to break easily, and it can handle quite a bit of weight. We like that it has a storage pouch underneath the seat. This makes things easier when you need to stow some gear but want to keep it close by. What we didn’t like is that it’s a bit squeaky out of the box. Fortunately, this is an easy problem to rectify with some oil. We’d recommend that you get cracking on it before you take it out on a hunt. You don’t want to spook your prey because you changed your position in your chair. If you’re looking for the best hunting chair, you need to be willing to try out a few options. What works well for some, might not be as perfect for others. We’ve given you a great place to start. We’ve narrowed it down to the five best options available. Where you go from there, is up to you. Need a bit more help narrowing it down? Let’s look at some things that you want to consider. Can You Try Out Some Chairs? Head over to your local sporting goods or camping store and see what they have to offer. Do try a few different chairs out to get a feel for them. We’re not saying that you have to make the decision then and there. In fact, we’d advise against that. Do your research and check what the prices are like online. You’ll usually get a better deal that way. When testing chairs, try different models. Try a tripod model, a high back model, and so on. That way, you’ll know what suits you best. Now that we have some idea of what you like, it’s time to look at individual features that might be important. Do You Need Arms or a Back on the Chair? Arms are something that we feel that we can take or leave with most models. It’s nice to have a spot to put your soda or beer in, but those arms are going to add extra weight. The more you’re going to moving around, the harder it’s going to be to carry the extra weight. It should be noted, however, that the arms on a chair are useful for more than just holding your soda can. You might use them to help steady your arms while lining up a shot. Also, the arms are often used as a way to add more stability for the structure. 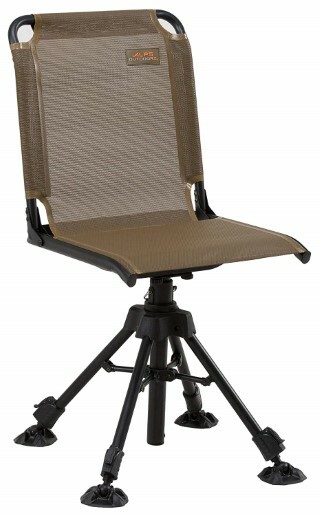 With a back on a chair, you have to also weigh up the extra comfort against the extra weight it adds. If you’re going to be sitting for ten to fifteen minutes stretches, the back might end up being more of a hindrance than a help. If, on the other hand, you’ll be sitting in a blind for hours, the back might become essential to your comfort. Again, that swivel mechanism adds extra weight. You have the added disadvantage that the mechanism can be noisier. It may make it harder to keep perfectly still in when lining up a shot. On the other hand, a chair that swivels can be useful if you need to be able to make smooth movements through 360 degrees fast. Nine times out of ten, though, swiveling is not necessary. When it comes to finding the best hunting chair, buying one that swivels should be a low priority. We’d advise you to set your budget before you get started. It’s easy to get caught up in all the cool gimmicks and gadgetry when shopping. During the heat of the moment, it will also be easy to rationalize why you need all those gadgets. A far better approach is to look at things more carefully. If you’re going to use those features, then great, it’s a good buy for you. If you’re not, you’re wasting money that could be better spent on ammo or something else. The best hunting chair will be one that doesn’t break the bank. The most important factor for any of these chairs is how comfortable they are. Are they worth lugging around with you? Is that extra feature that seemed so perfect in the store going to be useful or will it just weigh you down? You’ll need to give careful consideration to the type of terrain that you would usually hunt in. If the terrain is very uneven, it could be good to have adjustable legs. If it’s very soft ground, it would be a good idea to get a chair with bigger feet so that it won’t sink as easily. Above all else, you want something that will keep you upright and comfortable in the terrain you’re most likely to encounter. How comfortable a chair is will make much difference if you’re out for the day or overnight. If you’re going to be sitting in the chair for hours a day, you want to make sure that it isn’t going to bother you. If you’re not spending much time sitting, the extra weight of additional padding on a comfy chair might be more of a pain than anything else. Ask yourself what the most important aspect for you is. You can trim down many features to save yourself weight to carry. An uncomfortable chair, however, will always be uncomfortable. If you’re carrying a forty-pound pack, an extra pound or so doesn’t seem like a big deal. And, all other things being equal, it isn’t really. Until you’ve been hiking for a couple of hours. Cut down weight as much as possible. You’ll get more time spent actively hunting rather than resting.